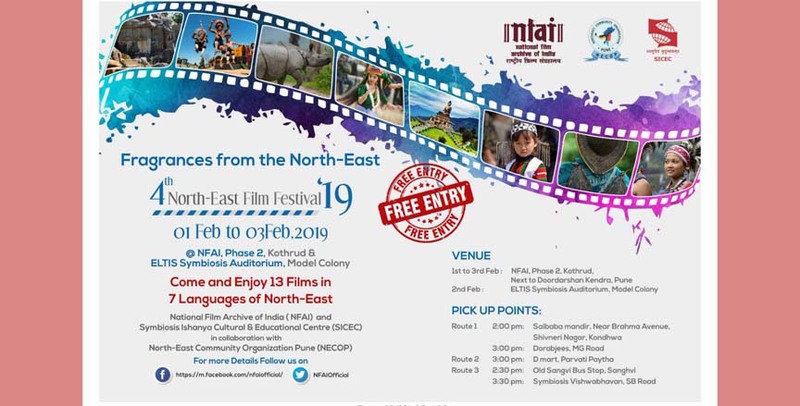 Pune in Maharashtra is all set to host the fourth edition of the Northeast Film Festival 2019. The film festival, which will begin on February 1, will continue till February 3, 2019. The festival will showcase various films from the northeastern states of the country. The three-day film festival will feature a total of 15 films in seven languages, including two bilingual films. The festival – Fragrances from the North-East – is being organised by the North-East National Film Archive of India ( NFAI) and Symbiosis Ishanya Cultural & Educational Centre (SICEC) in collaboration with the North-East Community Organization Pune (NECOP). We are excited to host the 4th North East Film Festival from 1st to 3rd February at NFAI, phase 2, Kothrud! Apart from films the attendees will also have an opportunity to enjoy a cultural festival & relish delicacies from the #NorthEast! The screenings of the films will be held at two venues – NFAI’s Kothrud campus and English Language Teaching Institute of Symbiosis (ELTIS) in the Model Colony. The opening film of the festival will be Dominic Megam Sangma’s Garo language film ‘Ma.Ama’. Rima Das’ Assamese film ‘Village Rockstars‘, which was India’s Oscar submission, will be screened at the closing ceremony of the film festival. Among the two bilingual films that are to be screened at the festival, one will be a Sylheti-Bengali film and the other will be an Assamese-Manipuri film. Apart from films, many food stalls will be also set up to serve northeastern cuisines to the visitors to the film festival. Tourism promotion initiatives will also be taken at the venue. Many eminent film personalities from the Northeast have been invited to attend the festival.